When iControl Data Solutions and Hüify started working together, the focus was on driving inbound leads for iControl’s sales team. After redesigning iControl’s website incorporating inbound best practices, the focus shifted to developing content offers such as ebooks, white papers, infographics and videos. Using inbound methodologies, that content was then leveraged as part of a comprehensive social media strategy, as well as blog posts, email campaigns and webinars. These joint efforts increased inbound leads by 1000% over the course of a year. Now equipped with an average of 40 qualified leads per month, Hüify and iControl were crushing it with the website, as well as inbound marketing efforts. The influx of leads justified the need to have a dedicated salesperson with an inbound methodology focus. Through Hüify’s sales enablement services, Hüify and iControl worked together to build out a sales process in preparation for the hire that helped iControl’s team to more efficiently convert inbound leads while taking advantage of the traction inbound marketing was creating. Hüify’s sales enablement process follows the sales enablement methodology of giving sales teams the ability to sell by providing the Goal, Processes, Systems, Technology, and Content needed to improve sales performance, which increases revenue for the organization. Each phase of sales enablement consists of a main goal with supporting discussions, documentation, and content. Goals: Agree on important objectives that will advise deadlines and priorities of the Sales Enablement process. Process: Create and agree upon a documented sales process that the sales team will adhere to and improve on over time. Systems: Document and systemize who does what and when within the Sales Process to create cross-departmental alignment. Technology: Determine and document which technology tools will be utilized by sales teams to add efficiency to the Sales Process. Content: Determine opportunities to optimize existing content and/or add new content to the Sales Process. Without goals, an organization has no heading to aim towards - often leading to misalignment. But, goals can’t just be made to make them. They have to be S.M.A.R.T. They have to be documented. They have to be visible. They have to be tracked. Most importantly, they have to be agreed on by both marketing and sales teams. iControl’s marketing and sales teams had the same overarching goal (increase revenue), but progress on marketing efforts were measured solely based on more traditional marketing metrics like impressions, number of leads, conversion rates, etc. Understanding and agreeing on goals is the foundation of all of our engagements with clients (sounds like a no brainer, right?––turns out it’s actually less common than you think). We started our engagement by establishing a set of awesome S.M.A.R.T. goals both the sales and marketing teams could really get behind. These weren't your run of the mill marketing goals based on lead volume and “reach” (whatever ‘reach’ is nowadays?) These were bottom line revenue and new customer goals that we were signing on to help our partner hit. This alone changes the tone of any engagement. We pushed to focus on revenue as a real component of marketing success. It added revenue generation as a key evaluator of our success as marketers, and inbound salespeople. 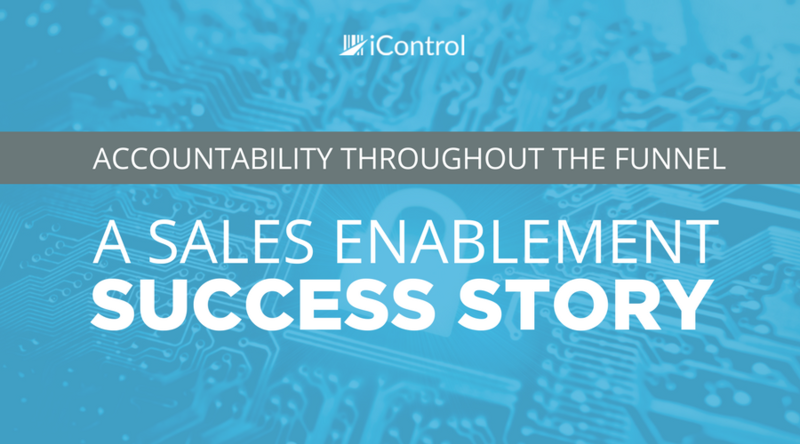 With revenue accountability, marketing was no longer viewed as just support for outbound sales. Our efforts continue to drive new revenue also helped to justify additional budgetary investment in those efforts. As part of these goals, Hüify created a tracking spreadsheet to get a pulse on iControls current performance to identify the key metrics they needed to increase in order to accomplish this growth. We then set quarterly and monthly goals as stepping stones on our way to achieving our annual growth targets. Hüify built reporting dashboards to track progress and demonstrate value at a glance, finally giving the sales team a way to measure their success. These dashboards, built with the HubSpot Reporting Add-On, are easily accessible and understandable by all team members. Weekly and monthly reports are reviewed by both sales and marketing teams and C-suite level executives. This provides a high level of transparency and accountability from every team member at iControl and Hüify. The sales team was primarily organized by the product they had the most experience with (traditional product-based selling). Since the sales team sold based on the product, some leads were reassigned to other salespeople based on what the lead was interested in. A lead would convert on the site by requesting a demo for one solution, realize they were also interested in another and then possibly be transferred to a different sales person. This could potentially extend the sales cycle and limit the opportunity for cross-selling iControl’s product offering, many of which work in tandem to provide the client with a more comprehensive solution. With team goals agreed upon and the metrics defined, we conducted a sales process audit, documenting each stage and step of their current process. This effort was made in advance of hiring a dedicated inbound salesperson to ensure that additional resource was able to support and advance this new approach of sales enablement on day one. 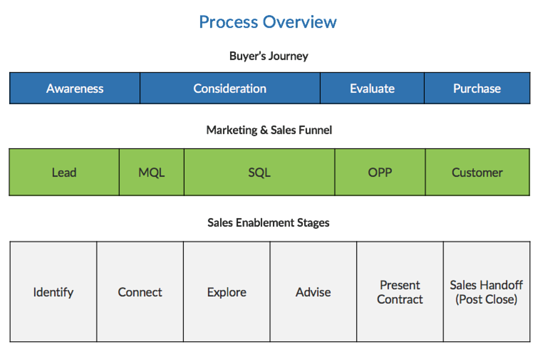 Now knowing where the gaps were, we were able to define each stage of the sales process––focusing on the way people want to buy, not the way we want to sell. This was a huge game changer for iControl. We were building out a process that continued the client-focused inbound methodology from marketing through to the sales process allowing for complete alignment. By having a documented process to understand the key items that need to be completed before the deal can move forward, every member of the team is on the same page when looking at deals in the funnel. This makes the lead pipeline accurate and predictable. Every inbound lead follows the same process, regardless of the original product they are interested in. Inbound sales people are able to build the conversation around finding the best solution for a lead without disengaging and making a handoff in the middle of the sale. With a focus on understanding their goals and pain points, the inbound sales team has identified multiple opportunities for cross-selling and have even entered new markets. Process helps us understand the big picture, where the system helps us understand the details (who, what, when, how). Through our marketing strategies, marketing and sales team alignment was consistently pushed for by asking questions about follow up systems and providing suggestions to ensure leads were being properly passed between teams, but a system of accountability was necessary for uniting these efforts. To create complete alignment, we united both sales and marketing teams to commit to performing a degree of service to benefit each other, leading to a gained sense of accountability to each other and establishing a teamwork mindset. Having a dedicated Inbound Salesperson has allowed us to engage leads more efficiently using HubSpot to track the entire buyer's journey - improving sales person accountability at every stage. For each new system created, we created a document to outline each step in the process and the roles for each marketing and sales team member. Once the system was agreed upon by the team, supporting sequences, workflows, and structures were created. Within 5 minutes of a lead becoming a MQL, both teams are notified, contact history is reviewed, and the inbound salesperson reaches out by phone. 100% of inbound leads are now followed up this way. Marketing and sales teams both have insight into who, when, and how leads are being followed up with. This is a huge source of team unity as everyone gets pumped when a lead notification pops up. Marketing completed and hosted a series of webinar campaigns - with one bringing in 23 leads. Marketing reached out to contacts using workflows, while collaborating with the inside salesperson to follow up after the webinar with sequences. Email sequence resulted in a 40% email reply rate. Marketing identified a list of contacts who would be qualified for sales to prospect. 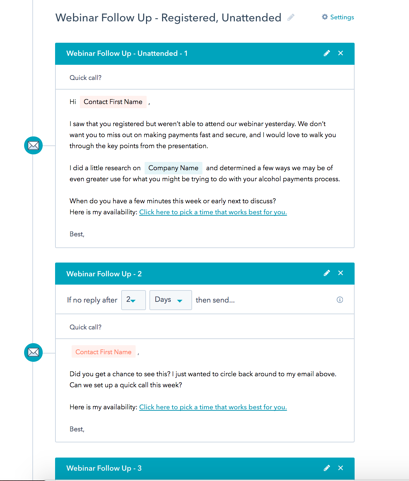 We created an sales email sequence (including supporting content provided by marketing) to enroll contacts in. Prospecting campaigns resulted in a 43% reply rate. Inbound Salesperson utilized the HubSpot CRM and Sales Pro to research contacts and track communication with leads. Marketing and sales sync weekly on how the content is doing, discuss suggested changes, and collect ideas for future content. The sales team had little to no engagement with the HubSpot CRM. There was no structure around learning the technology because the sales team was using other platforms to track their progress. In order to assign leads, marketing set up Zapier integration with Slack to send contact info for anyone who submitted a form for a demo request, specified BOFU resources, or the Contact Us form to a specific channel tagging the appropriate salesperson. That lead would be followed up with a phone call, usually followed by an email, though it’s hard to say because there was no visibility to the sales follow-ups with activity being managed in a separate CRM. With no insight to the history of the lead, the sales team was not able to approach the sales process with an understanding of the context of the call. Typically, everyone wants to jump to technology immediately because of the belief that it will solve all of their problems. Technology without a process or system will only make matters worse, and it will be almost impossible to utilize a data feedback loop. Once the process was documented and systems were understood, we incorporated the technology iControl needed to automate, scale, and properly maintain both the process and systems. With all of the information being tracked in HubSpot, utilizing HubSpot Sales Pro and the CRM as the most efficient way to close deals was a no-brainer. 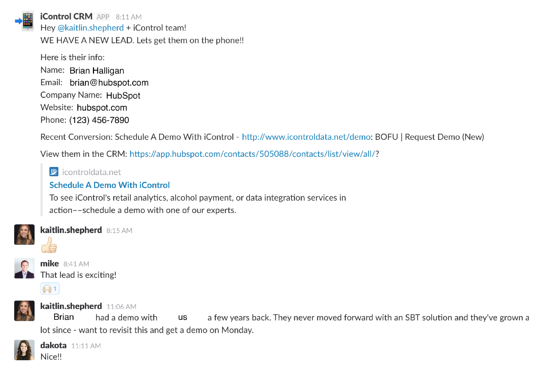 With the Inbound Sales team working completely inside HubSpot, they are able to use the same Zapier/Slack setup to follow up with leads in less than 5 minutes and also have a complete understanding of the position the lead is at in the buyer’s journey. Using the PandaDoc integration with HubSpot CRM, we consulted on revising and optimizing current contracts to provide a faster way to close deals and complete visibility into what content is important to contacts during the sales process. 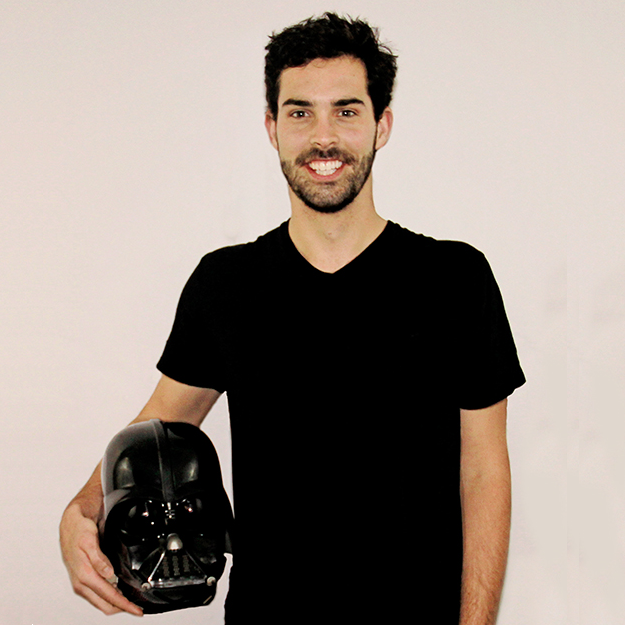 The changes made at iControl wasn’t the result of a new platform or a new tool. The technology was all the same, but there’s more buy-in and accountability. The Inbound sales and marketing teams now both use HubSpot, and can depend on all of the team members to pull their weight and use it effectively. Prior to Hüify’s sales enablement services, the marketing team attempted to utilize the sales team to create and optimize content based on the sales teams’ conversations with leads. However, the communication cross-departments and the hand-off between teams was difficult as the sales team juggled wearing both inbound and outbound sales hats. People expect a logical flow from one stage of their buyer’s journey to the next, and the misalignment between teams is apparent when the message isn’t consistent. It was challenging for the sales team without an inbound perspective to fully leverage marketing content pieces in the right way, and at the right time. Sharing content should be done strategically and in the context of where the buyer is at in their journey. Content, like technology, is also a phase that many people want to use as a quick fix to get results. This isn’t a quick fix. Great content comes from understanding the proper context of where and how it’s being used in the sales process and who will be receiving it. Our email templates now see reply rates between 38-46%. Having a dedicated inbound sales team (with a marketing focus) ensures content and strategy is refreshed based on feedback that is garnered in sales calls and interactions. This guarantees that the message is always refined and reflects the most up-to-date trends in the market and competitive activity. The culture shift allowed the company to focus more on inbound strategies, allowing for more marketing budget and a larger team. The sales team understood they were responsible for timely, effective follow ups, while marketing would continue to drive the efforts that brought in MQLs. As a direct result of these changes and optimizations, the first inside sales rep closed a deal with an inbound lead within her first 30 days that was one of the largest of the quarter.